I am inspired by historic knitted pieces, by the colors chosen, the delicate motifs, the differences in garment construction, and knitting techniques you don't see often today. I love to visit museums to look at pieces in storage. Unfortunately, knitting doesn't make it out of storage often in most museums. When considering pure knitting pleasure, it's a toss-up between cabling and stranding with two or three colors. My favorite technique to teach is Twined Knitting. It evolved from working with knitting magazines. 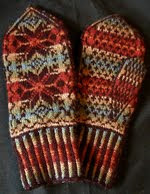 I generally work with three sizes (kids, woman, man) for socks and hand wear, and 36 (40, 44, 48, 52) inches for sweaters. When I wrote Knitting Ganseys in the early 1990s, I sized the garments in two inch increments. Now I don't think that's really necessary. Because I draw from historic designs, I don't worry about inadvertently copying someone else's work. When I do find time to open a magazine, I enjoy seeing what others have created. Isn't it amazing... the variety of garments out there? I feel it is essential to have many levels of patterns because there are many levels of knitters. I don't "dumb down"; I state the level of each pattern. My patterns are teaching patterns. I add historical background whenever possible. There are almost always several photographs and lots of text included explaining techniques necessary in the pattern. I am hoping that my patterns elevate the level of the knitter. I have two sample/test knitters right now who knit for me. I will knit up small things, but I farm the sweaters out because my hands can't take too much knitting at a time any more. A really good test knitter is an incredible asset. Hmm... I did at one time, when I had my Internet business. I am in the process of writing up a new one, 10 years later, that will reflect my business as it is now. But it keeps taking a back burner to other deadlines. I have had many mentors in the past. I don't really have one now. I think a mentor is someone we all need in all aspects of life. No, and that's a shame. I think I must have missed out on a lot of information, by not doing so. I just plug along doing what I think will work and probably expend more energy than necessary. I guess it's not too late to find one! 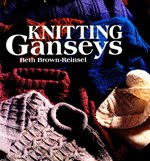 I remember when I was writing Knitting Ganseys (on an Apple IIe: 128k- had to save to disk every four pages typed) I kept hearing about this "Information Superhighway". Within a couple years (1995), I had a website and was selling my patterns, knitting tools, and yarns imported from England over the Internet, as well as by mail order. That was a huge leap. But now, it's an unimaginable leap: selling pattern downloads, doing all my correspondence by email, the potential for Internet based classes and meetings, the videos on You Tube, email marketing sites, my blog. I spend a huge part of each day on the computer. This has been one of the huge lessons I am trying to learn. I typically work a run of 14 hour days until I can't bear to sit another minute, then go do something else for a few days until I can start the cycle all over again. I think that's called "Crash and Burn" and there's nothing balanced about it. At the present, I am trying to go to yoga/exercise class three times a week and it's helping a lot to even out my thinking processes and productivity. It also helps my temperament to get together with a friend for dinner at least once a week. Not that I actually do that consistently, but I am striving towards it. On a good day, I try to listen and appreciate where the other person is coming from, intuit what her needs are, and figure out how to meet those needs. I have come a long way from taking every cross thing said as a personal attack. I don't read any knit lists on the net that have the potential for conflict. Life is too short for criticism. There's barely enough time to say the good things to others. Well, there's nothing like a separation and two kids to feed to light a fire under you! That's a hard question to answer since my Start Date could be one of many dates. Because I see myself as a teacher first and a designer second, I can say that I began teaching on the national circuit in 1989, and was separated in 2001, needing to totally support myself. Looking back, I really needed those 12 years (and the ten that preceded them) to establish myself as a teacher and designer while having the luxury of being partly supported by someone else. It's been hand to mouth many years, and I do not have a retirement set aside. I am turning 60 in a few years, and that is a huge worry for me. So supporting one's self can mean many things. Consider yourself lucky if you have a life partner helping with the bills and perhaps a former career where you were able to set aside funds for the future. Be diverse. Know that you will likely not be able to support yourself in just one area, such as designing. Look into tech editing, teaching, Internet courses, creating knitting events, writing, selling yarn, etc. Secondly, live simply, keep your expenses down, and don't forget to pay into a r etirement of some sort. And good luck!